stands for consistency and quality. 90 years of know-how makes. Open a carton. Taste the quality. 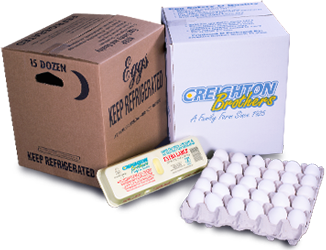 Our eggs have been delighting families for ninety years. It’s the result of our family’s commitment of making sure that the eggs you eat come from healthy, well-cared for flocks, as well as practicing stringent food safety requirements. We package this perfect food in medium, large, extra large, and jumbo grades and provide them in retail cartons and loose flats for foodservice. The eggs and packaging may come in a variety of sizes, but the taste and nutrition remains the same. Learn more about each of the ways you can receive this deliciously satisfying food by clicking on the items below. This natural, nutrient dense food provides the highest quality protein and comes in its own package. 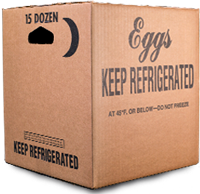 (Retail – Cartons) The eggs and packaging may come in a variety of sizes, but the taste and nutrition remains the same. Learn more about each of the ways you can receive this deliciously satisfying food by clicking on the items below. 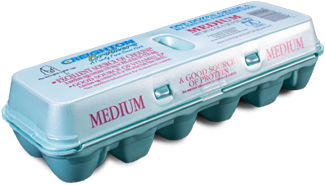 (Retail – Specialty) The eggs and packaging may come in a variety of sizes, but the taste and nutrition remains the same. Learn more about each of the ways you can receive this deliciously satisfying food by clicking on the items below. 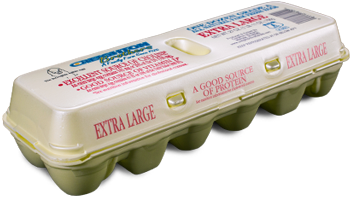 (Retail – USDA Shielded) The eggs and packaging may come in a variety of sizes, but the taste and nutrition remains the same. Learn more about each of the ways you can receive this deliciously satisfying food by clicking on the items below. 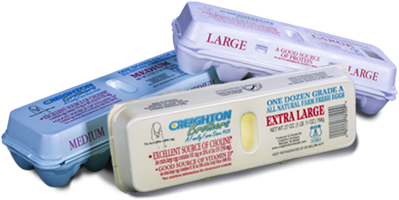 (Foodservice – Loose Flats) The eggs and packaging may come in a variety of sizes, but the taste and nutrition remains the same. Learn more about each of the ways you can receive this deliciously satisfying food by clicking on the items below. 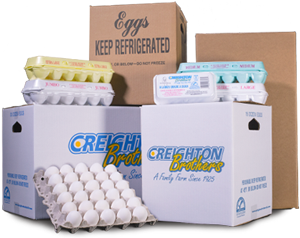 (Foodservice – Brown Case) The eggs and packaging may come in a variety of sizes, but the taste and nutrition remains the same. Learn more about each of the ways you can receive this deliciously satisfying food by clicking on the items below. 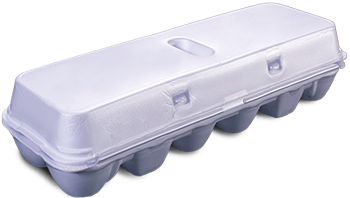 (Foodservice – White Case) The eggs and packaging may come in a variety of sizes, but the taste and nutrition remains the same. Learn more about each of the ways you can receive this deliciously satisfying food by clicking on the items below. 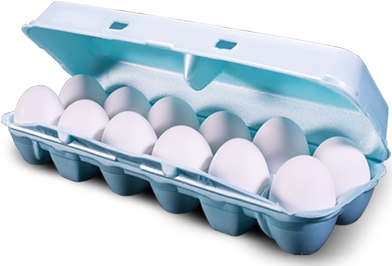 (Foodservice – USDA Shielded) The eggs and packaging may come in a variety of sizes, but the taste and nutrition remains the same. Learn more about each of the ways you can receive this deliciously satisfying food by clicking on the items below. Since the Avian Flu outbreak of 2015 we no longer entertain on farm or plant processing tours. We do have a room at Creighton’s Crazy Egg Cafe & Coffee Bar in which you can “tour” viewing a sample of today’s hen house equipment and watch “live hen” video as well as company videos and discuss the farm and it’s operations! We can include a breakfast or lunch for groups over 20. Just call 574.376.2465 for more information and scheduling. Each egg has 13 essential vitamins and minerals in varying amounts, high-quality protein and antioxidants all for just 70 calories. Eggs are an excellent source of choline and selenium and a good source of high-quality protein, vitamin D, phosphorus and riboflavin. The nutrients in an egg can play a key roll in weight management, muscle strength, healthy pregnancy, brain function, and more. Want to learn more about eggs and nutrition? The Egg Nutrition Center monitors scientific research regarding eggs and offers a wide variety of information. Go to www.enc-online.org and www.incredibleegg.org/health-and-nutrition. For both at home and food service kitchens click on either of the links below for the American Egg Board’s incredible supply of fabulous egg recipes! We are always looking for good people ready to connect with their place on our family farm – working with the hens and egg collection, at the processing plant cleaning and packaging eggs for our customers, a variety of maintenance jobs or out in the fields. We also have the new Creighton’s Crazy Egg Cafe & Coffee Bar! We hope we have a match for you! Performs the handling of poultry (to catch, count and vaccinate as needed) and maintains the Brooding (growing) house. Includes but is not limited to the cleaning and sanitizing of machines for preparation of next day production. 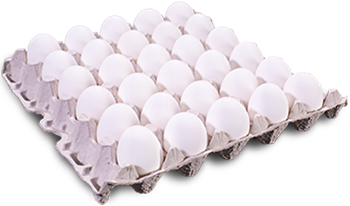 Includes but is not limited to controling egg flow, stacking eggs onto pallets while maintaining packer clean and in functional conditions. Considered medium work, performs seasonal maintenance and assists the packer stacker and house operator as needed. December 9, 2017 at The Roost (@Creighton’s Crazy Egg Cafe) come and go between 5pm and 7pm. Santa for the kids at 5:30! 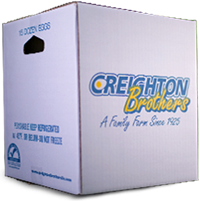 As a Creighton Brothers group would you like to have a picnic again or maybe see a South Bend Cubs or Ft Wayne Tin Caps game? If so, contact Mary or send an email from the website below and let us know what you are interested in doing! For any employee with Creighton Brothers who has been employed at least 5 years with a dependent child wishing to take some form of post high school training or college, we have $500 per school year to help with his or her expenses! Inquire with Mindy or Mary for details. If you have a question, comment or experience you would like to pass along, please drop us an email and the appropriate person will get to it as soon as possible! © 2014-2019 Creighton Brothers, LLC. All rights reserved.